Visual consistency helps you stand out online and helps you to be easily recognised by your target audience. Brand consistency is about knowing if your audience can instantly notice you in the sea of millions of visuals. Here are a few hints and tips to get you started. Make sure logo variations are placed on the right backdrop every time. For example, use white logo on dark backgrounds, use colour logo on light backgrounds. If you have an emblem or icon of your logo then be sure that this is used on social media profiles, posts and photography. Keep it subtle, but easily noticeable. Your logo may have one or two main colours. When posting content stick to a pattern. For example use one colour for your quotes, and the other colour for your photography. Adding a rainbow of colours to different posts is going to confuse the pattern of your brand. Unless of course your brand is a rainbow! Fonts are extremely important in visual content. You will usually have a couple of fonts for your brand. We recommend no more than 3. In fact a heading font, subheading font and a body font is a great way to keep it consistent. Never randomly change your font from post to post. It may just seem like words and it doesn't matter as long as they are on the post, but it matters just as much as the imagery you use. Some brands use only fonts for their content. There are trillions of images posted online every second. You need to stand out. The way to do this is to build a gallery of images that represents what you do or what you sell in a way that people can relate to. For instance if you sell cakes, your imagery should make the consumer feel like treating themselves to one. Make them indulge in the imagery and they will crave more. Show your products in the same light as the consumer would see it. You almost need to act as a consumer to get this right. If your business isn't product based and its more about you and your services, then you need to think about your theme. If you sell business consultancy for instance use imagery that depicts the results of your success stories, or choose imagery that you find inspiring to your own story, and tell it! 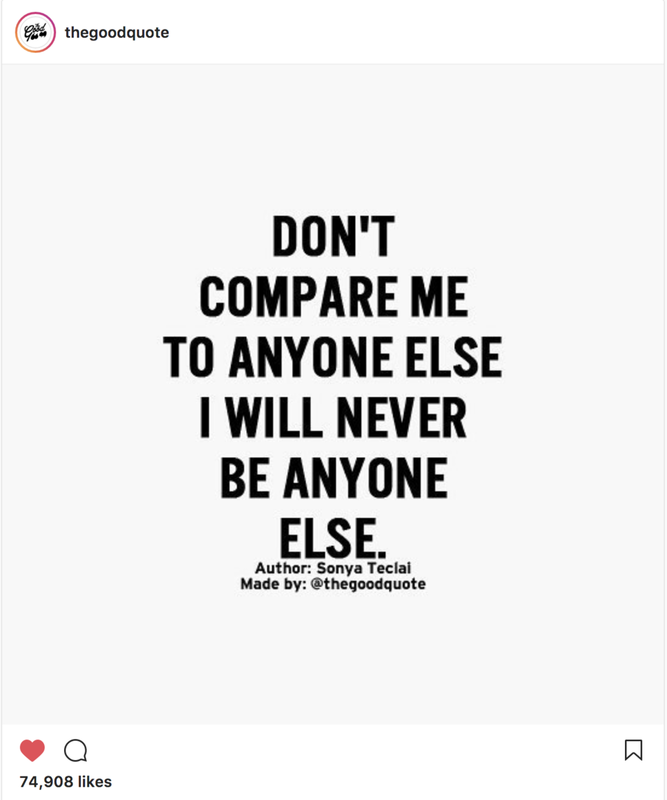 Don't be afraid to show yourself sometimes too. People love to see the face behind the posts, it builds trust. Starbucks is a great brand to draw inspiration from. Their use of consistent content is key to their successful online presence. Notice how their imagery is subtle, but with each piece a little glimpse of their logo in various forms promoting their products. 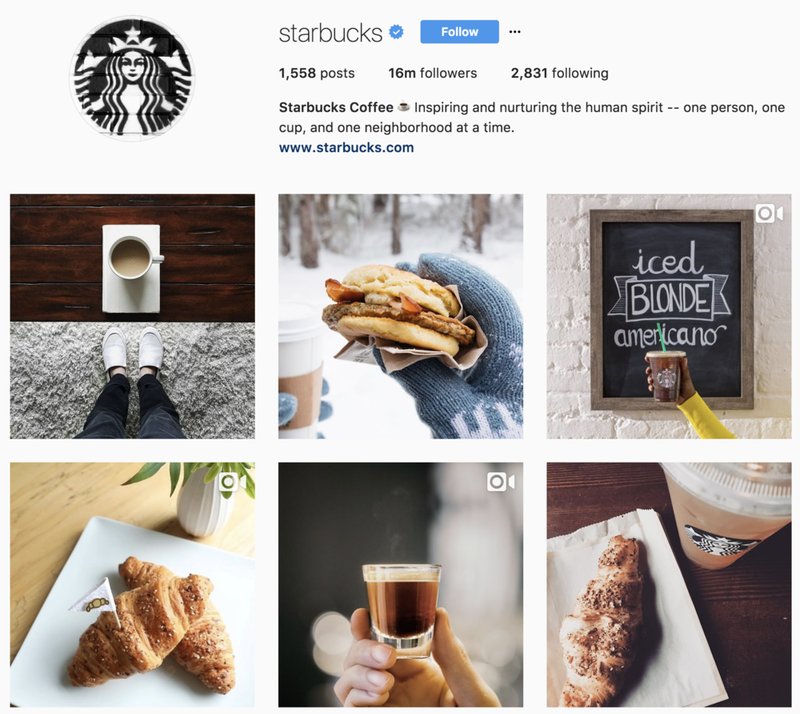 Starbucks also cleverly finds and regrams or reposts images from their enthusiasts; each image depicts a setting consumers can easily relate to. This visual content excels in building a strong relationship with consumers. 'The Good Quote' use a bold black san serif on a white background for all their quote content. Simple and striking. They have 13.5 million followers. Their content is always consistent without being overloaded with imagery. Don't be afraid to use white space in your content. Viewers like to understand the message quickly. GoPro always go beyond just selling their product. They give meaning and purpose to each post. Find what your followers are most passionate about and consider using a competition to encourage your followers to share photos for you to regram or repost. They also use relevant hashtags to increase their posts visibility. Try using 5-10 hashtags per post to increase the visibility of your posts. For more information on how Hashtags can boost your brand audience click here. Your Visual content has to be easily recognisable, it's not just about having your logo on everything you post out. In fact some big brands don't even need to show their logo and still succeed in visual consistency. Being inconsistent can put consumers off, they get confused as to who you are, and what you offer if the content doesn't appear naturally cohesive. For example, if you are using too many variations of your logo every time you create a visual, then you’re not being consistent with your visual branding. This applies to using different colours and fonts as well. You may feel like creating something new each time to appeal to your audience, and whilst it might be a great visual, it may not impact the audience as it should because they won’t recognise your brand overall. You can easily create various themes of content for your brand, this is a must as no one likes to see the same thing over and over, but the key is to keep it consistent. Get in touch with us to find out more about how we can assist you with your visual content, and help boost your online presence with cohesive branding.